Oxygen kicks off the respiration cycle. Solu-Oxy 20-0-2 delivers oxygen rich compounds to the root zone to promote turf respiration and the aerobic metabolic pathway. Solu-Oxy must be watered in immediately after application. The unique process, by which this product is manufactured, incorporates pre-digested amino, humic, and fulvic acids. Other beneficial components include calcium, vitamins, enzymes and fermentation extracts. 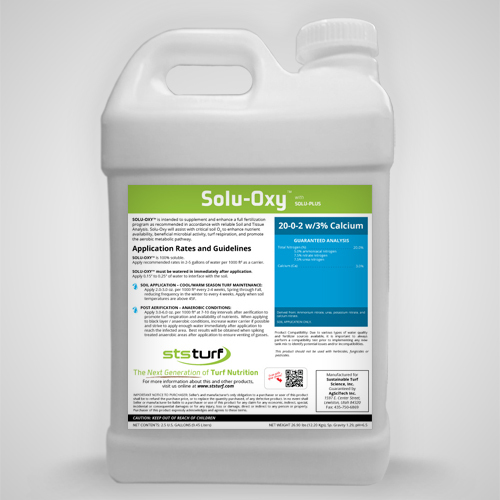 Solu-Oxy 20-0-2 delivers multiple forms of nitrate (NO3), resulting in delivery of oxygen rich compounds where soil O2 is needed, to naturally supplement and assist with promoting aerobic conditions, stimulate microbial activity, turf respiration, and rooting potential. This “Next Generation” product can be used as a management tool for anaerobic conditions such as black layer. Solu-Plus is included to further assist with nutrient availability, and uptake efficiency, while providing a rich source of carbon, complex carbohydrates, vitamins and enzymes.